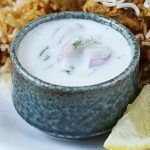 Onion raita recipe for biryani – a side dish to accompany biryani or pulao.. Raita is a side dish made with yogurt and is often served with biryani and any kind of pulao. Ingredients like onion, chili, mint or coriander leaves are used to make it. Some recipes even use pepper powder and cumin powder, which we personally don’t prefer in a onion raita. Sometimes I do add very little lemon juice to add slight sourness, if the yogurt is fresh. mint raita, cucumber raita, boondi raita, onion tomato raita, burani raita, fruit raita are some of the popular raita varieties made in the Indian and pakistani cuisine to serve with biryani and pulao. You may like to check this collection of raita recipes. Raita is usually accompanied with a biryani, pulao or any rice dish and with most non-vegetarian dishes. I even have it as a side with my roti, multigrain roti too when I’m unable to prepare anything else. 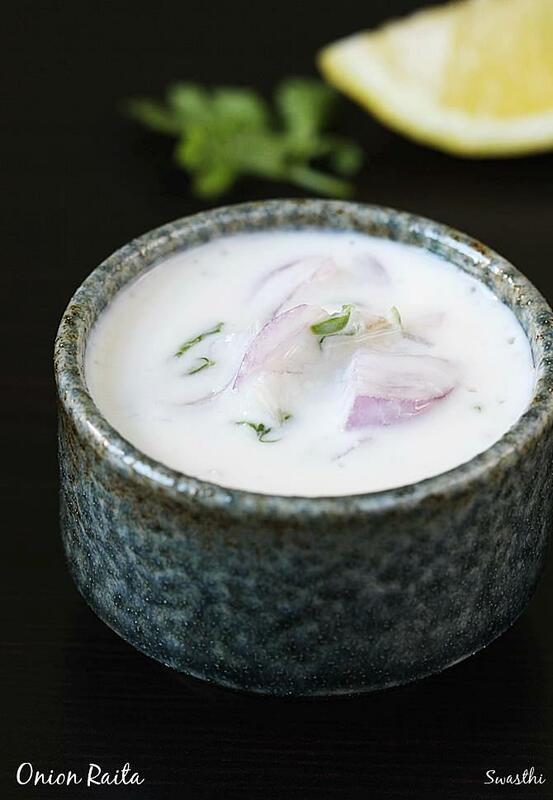 onion raita is very frequently made at home and is very very simple. This is the same i make to go with my veg biryani, chicken biryani, chicken fry, chicken curry too. To make a best raita, I suggest using good well set thick yogurt that is not sour. If the onions are very pungent, you can cut each onion to two parts and soak them in water for about 30 minutes. This makes them less pungent. Chop them and use. 1. Wash and peel the onions. Rinse under running water. 2. Slice or cube them and chop green chilies, add them to a bowl. 3. Add salt, yogurt, coriander leaves to the same bowl. Serve with your favorite biryani or chicken curry. 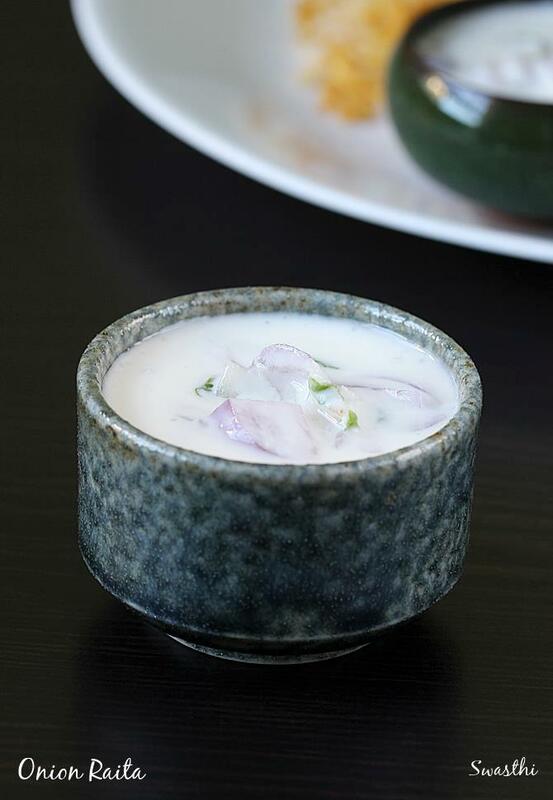 Simple raita, made with onions, coriander leaves, curd and green chilies. 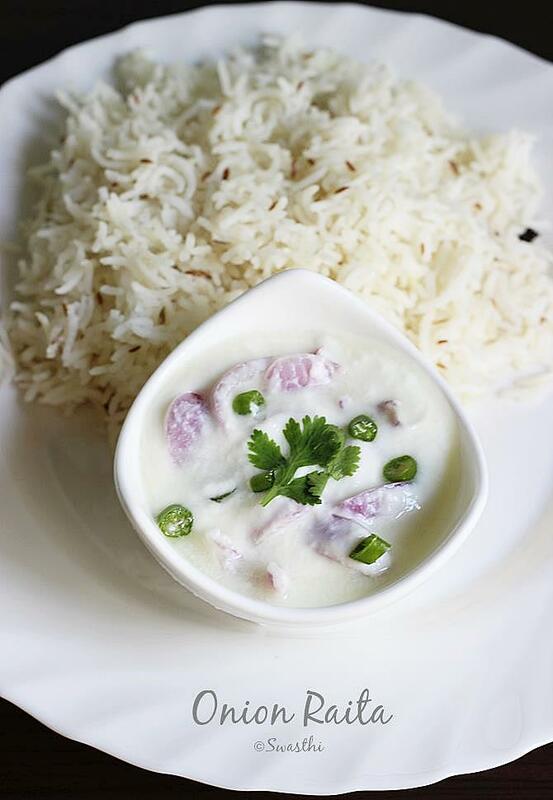 Onion raita is one of the most basic raita varieties that can be served with a chicken biryani, veg biryani or pulao. Wash onions under running water. peel off the skin and rinse them again. Slice or cube them.Wash green chilies and chop them. wash coriander leaves in a bowl filled with water. Drain them. Add yogurt to a bowl, add salt. Whisk the yogurt to smooth. Add onions, green chilies, coriander leaves to the bowl, mix well.Add more yogurt if needed. Serve onion raita with biryani or pulao. 1 tsp. ginger juice, few drops of Lemon juice, 2 mint leaves can be added. All these add their own flavors. Use them only if you like. For ginger juice, grate ginger or crush it and then add to a coffee filter. Press down with a spoon, you get ginger juice. Use only one tsp for the above mentioned recipe.